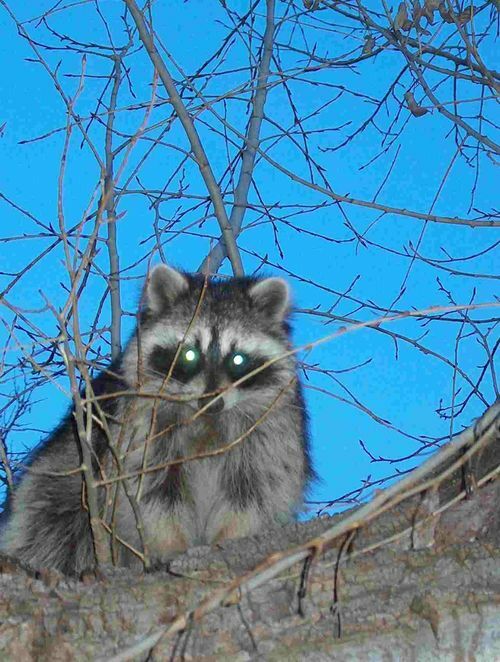 Wildlife: This raccoon drove the dogs crazy! This raccoon drove the dogs crazy! One day while home sick, I dragged myself to the computer to do invoices. Vinnie and Buck, who I'd put out in the "pen", started up with the barking. I kept typing. They barked some more. I kept typing. Buck gave up. Vinnie barked, and barked. Finally, I slammed the keyboard down on the desk, uttered a few choice words, and looked outside. The dogs looked upward, Buck silently, Vinnie in a barking frenzy. I went to look outside my daughter's bedroom window, and in the crotch of the giant old cottonwood, about five feet from her window, this is what I saw. It posed for about 15 minutes while I tried to get various cameras to work with the screen on; while I struggled to get the screen off; while I took the pictures. On this shot, I leaned out the window to get closer. It started walking toward me, and crouched, as if to jump. I recoiled back into the room and grabbed the screen. It watched me very closely, especially as I worked the latches on the screen, which refused several times, to go back into place, but finally cooperated. Don't tell me they're not intelligent. This one now knows how to do screens.